Join us at MeasuringU for the UX Book Club Denver event on Wednesday, November 28th at 7:00 PM! At this event, Dr. Jeff Sauro presents an overview of his new book, Benchmarking the User Experience, and a talk on UX benchmarking. Additionally, be ready for a night of networking and mingling with the accompaniment of drinks and appetizers. You may find free street parking located around the block of our building (3300 E 1st Ave, Suite 370, Denver, CO 80202). 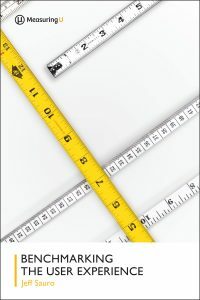 In this book, Jeff Sauro, Ph.D. uses practical examples to illustrate what benchmarking is and how you can use this technique to measure users’ experiences. Dr. Sauro uses many examples of studies from his company, MeasuringU, to give constructive information that will help you formulate and/or understand your benchmarking studies, which will ultimately help you understand your audience and customers.